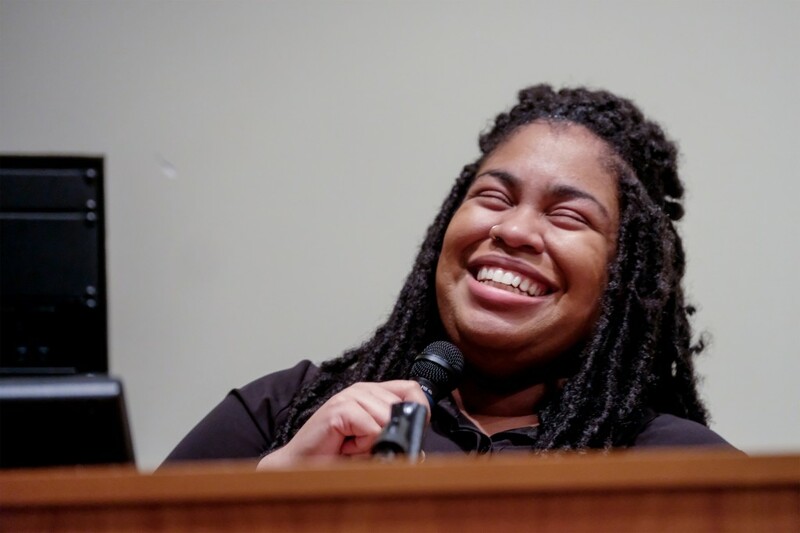 Amid life in the “hood,” author and Jackson native Angie Thomas distinctly remembers the day she saw a picture of Emmett Till lying in a casket on the cover of Jet Magazine. The author points out that many freedoms black people have today are because others took Till’s death personally and channeled their feelings into advocacy. 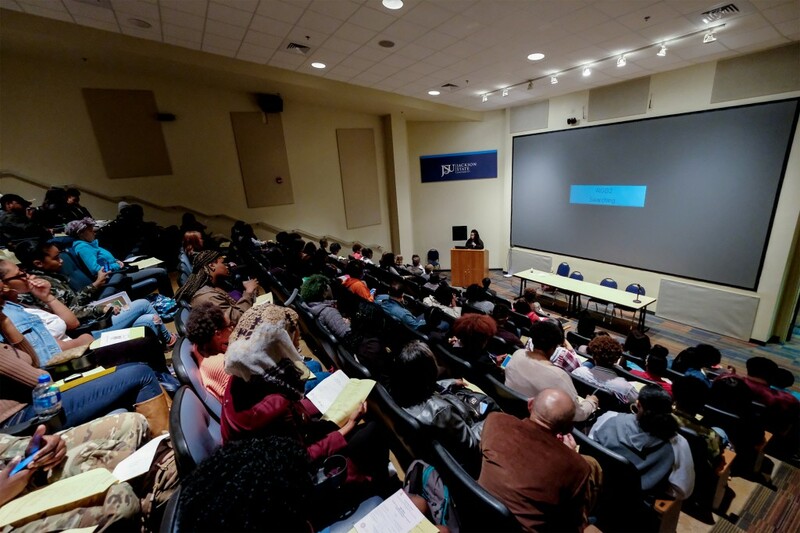 The program at JSU, “Finding Your Activism and Turning the Political into the Personal” presented by the Mississippi Humanities Council and Jackson State’s Department of English, Modern Foreign Language and Speech Communications gave Thomas an opportunity to share the experiences, ideas, and themes that led to her New York Times Bestseller, “The Hate U Give” (THUG for short). “The first thing you have to do is define your activism,” Thomas said. Inspired by the Black Lives Matter movement, Thomas’ book examines the themes of race, culture, class and police violence through the protagonist Starr who lives in an impoverished African-American neighborhood but attends an affluent preparatory school in the suburbs. Starr’s life descends into turmoil when police kill her unarmed friend. Thomas, who speaks unapologetically and directly and with a dry wit, wants the audience to know that “The Hate U Give,” in many ways, echoes her childhood and was influenced by the poignant and pivotal deaths of Till and Oscar Grant. While living in the Georgetown community, she recalls discovering the dark ills of racism through the lens of her parents. Thomas said “my Georgetown” has since evolved from the days of the KKK’s brazen behavior. Instead, she was concerned about drug dealers, gang violence and going to the park without getting caught in the crossfire. 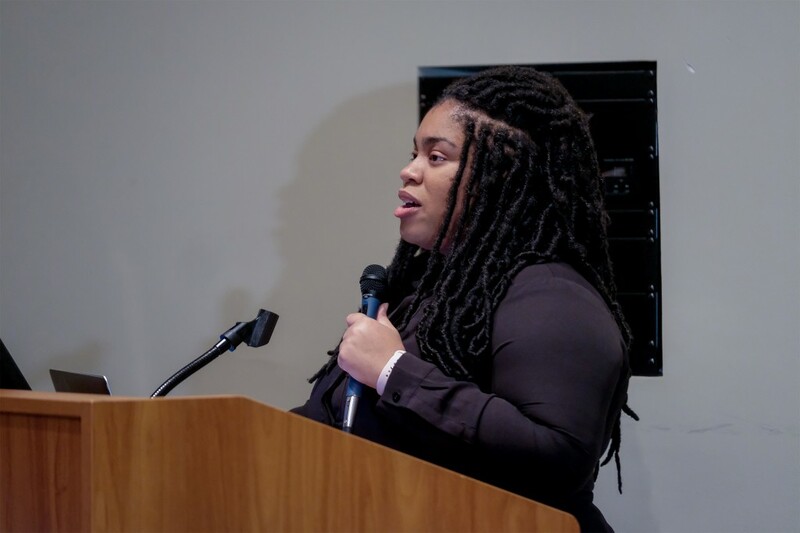 A 2011 graduate of Belhaven University, Thomas directed the discussion to her time as a young adult trying to strike a balance between the neighborhood she had known all her life and the world in which she was attending college. She spoke of “code-switching” — changing one’s vernacular or behavior to match an environment to circumvent negative racial stereotypes. Thomas identified several offensive moments where she was made to feel uncomfortable because of her skin color and remained silent until she could no longer allow ignorance to go unchecked. Receiving a ride home from a friend, Thomas said that as the car began to approach the Woodrow Wilson Bridge, the driver slammed on the breaks and stated that they could not cross the bridge because that’s where all the criminals lived. “That’s where I live,” Thomas said she replied. In 2009, the death of Grant, an unarmed black man killed by police in California, again reminded Thomas of people, like Till, whom she could easily relate to in a world that viewed them as threats. No longer able to stand on the sidelines she chose to “use my art as activism” and gave birth to the work that has now been adapted into a film starring actors Amandla Stenberg (“Hunger Games”), Issa Rae (“Insecure”) and Regina Hall (“Girls Trip”). The audience was quiet, intensely listening to Thomas as she charged them to be activists but demanded that they first have to be active. Thomas visit to the campus was a result of Dr. Shanna Smith, assistant professor of English, who shared the book with her class. The students enjoyed the work so much that they asked if the author could come to the campus. The professor said that the story resonated with students because the themes were relevant and the protagonist was relatable to their generation. 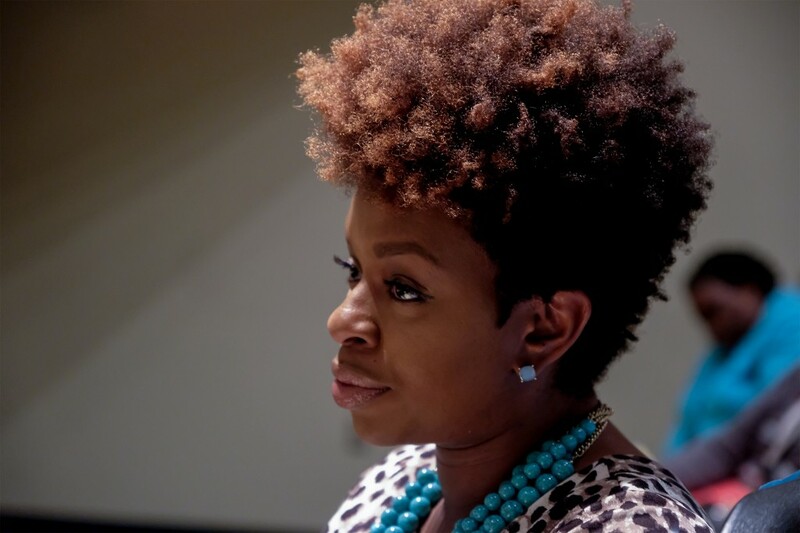 Jackson first lady Ebony Lumumba gave the welcome remarks at the start of the program and expressed her elation that Jackson State and the Mississippi Humanities Council brought the event to the capital city. She called Thomas’ intersection of youth, activism and literary arts near and dear to her heart due to her work as an assistant professor of English at Tougaloo College. “I also think it is key in how our young people will make their impact on the world and they’re all capable of doing it in various ways. She will inspire generations of young people, and I am glad that many of them will be out of our lovely hometown of Jackson, Mississippi,” she said. John Marcus Williams, a junior biomedical engineering major, described the book as strong and well-written while noting that he viewed Starr as a female version of himself growing up. Williams went on to say that a black renaissance was taking place with the development of author Ta-Nehisi Coates’ Marvel comic book series “Black Panther” and Ryan Coogler directing the record-breaking movie of the same title. Sophomore Daysia Kennedy appeared to be energized by Thomas’ words. “She was very moving and inspiring. Everyone from Jackson State should have attended because I felt like she put herself in our shoes. She relates to me in so many ways,” said the accounting major.